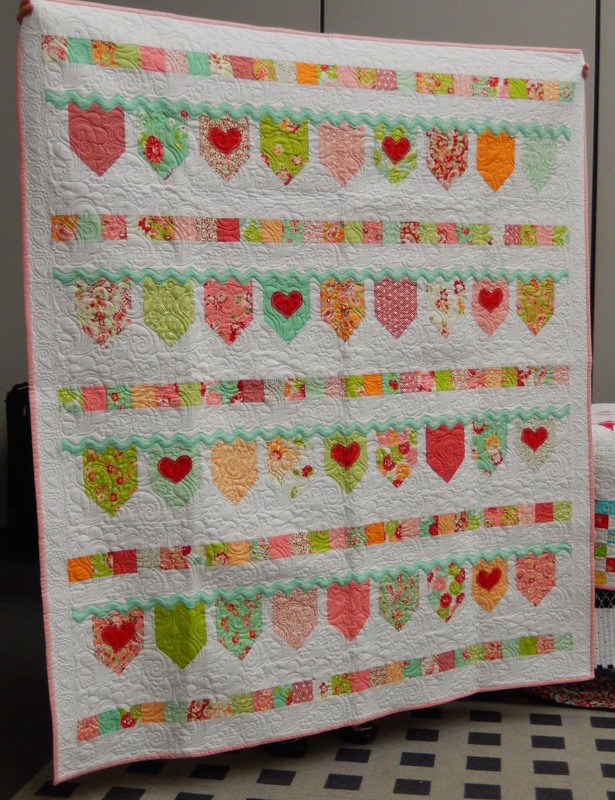 The day before Quilt Market opens in Houston, Schoolhouse sessions take place. Half hours sessions introduce industry professionals to the latest and greatest products and techniques. Let me give you a photographic tour. First up, Elizabeth Hartman of Oh, Fransson! 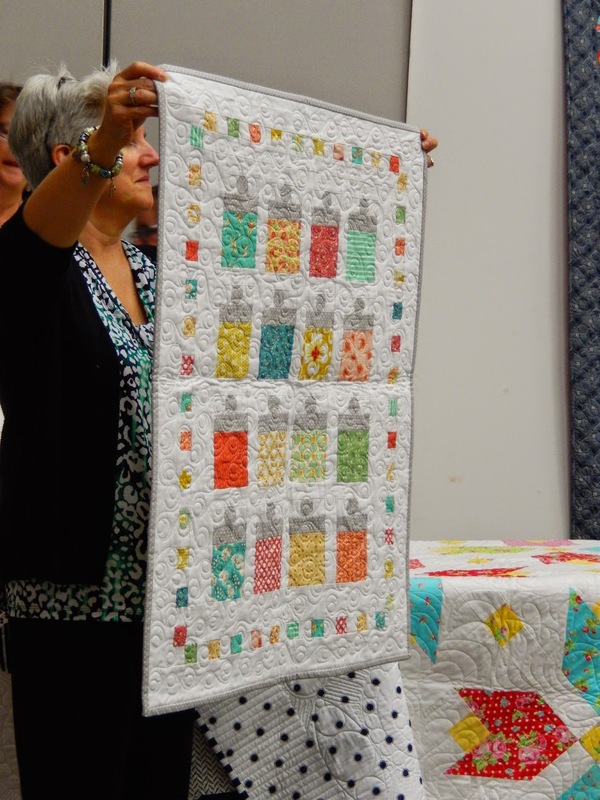 gave a trunk show of the quilts in her new book Patchwork City. Elizabeth used a background of Essex linen with a combination of black and white prints and color-grouped solids and prints for this version. A second sampler combined Violet Craft's Waterfront Park collection with solids. 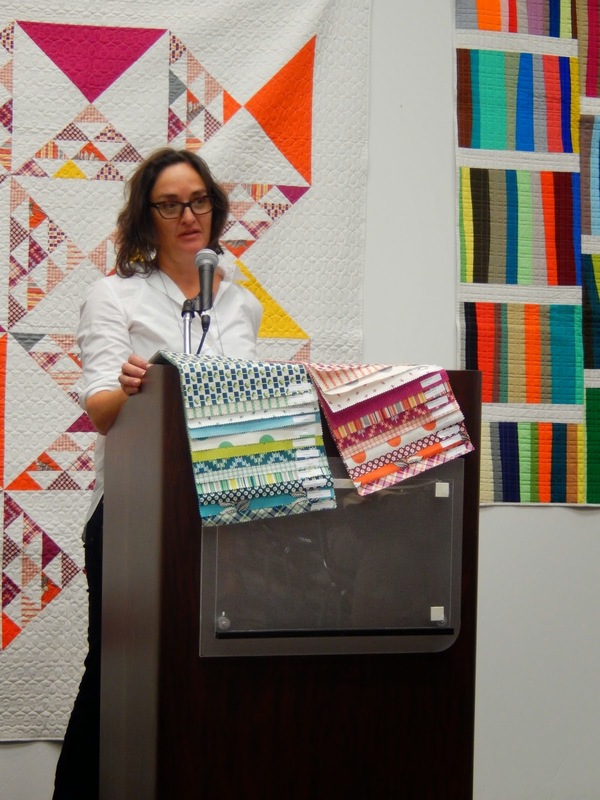 Dana Bolyard of Old Red Barn Co. presented her book Imagine Quilts . After meeting her in person, I can assure you that Dana is a wonderfully approachable person who is both considerate and humble. I adore this cover quilt. The use of low volume fabrics, polka dots, and bold prints is fantastic. 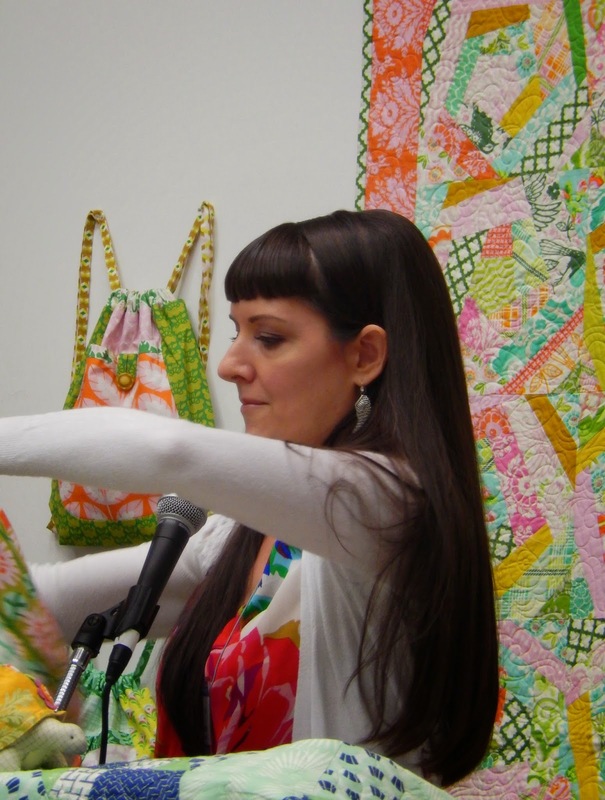 Amber Johnson of Gigi's Thimble gave her spiel on Vintage Vibe, complete with a showing of the included quilts. Scroll down, keep scrolling, and repeat, to see the glorious projects. 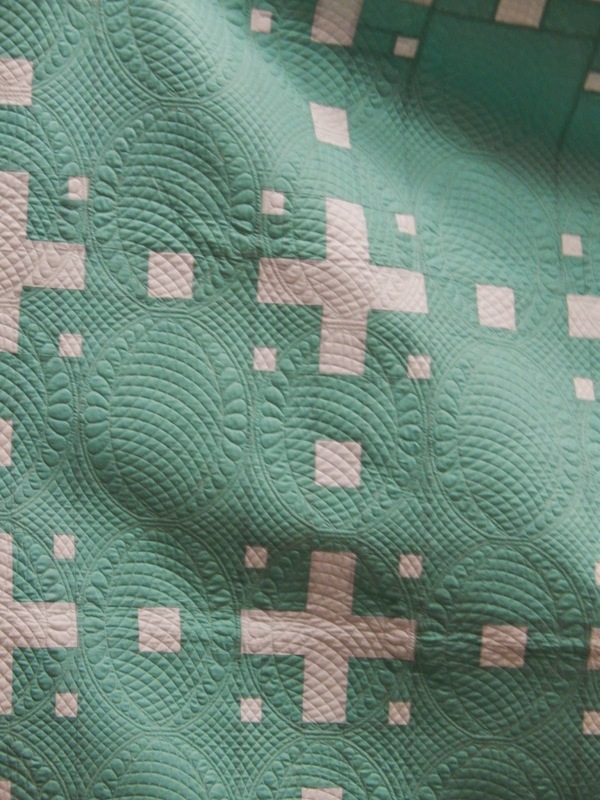 Anne Marie Chaney of Gen X Quilters revealed her striking BOM in solids. 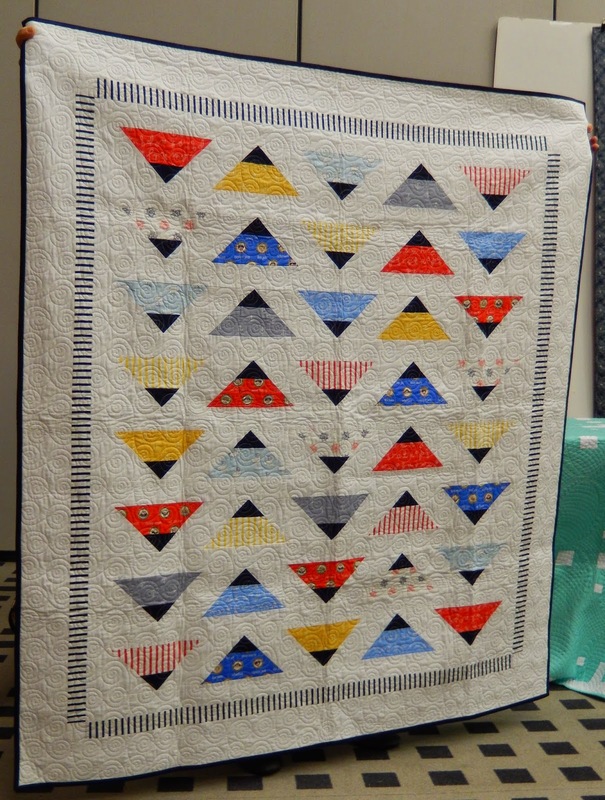 She found a clever way to combine the sampler and enlarged-quilt-block-as-a-quilt concepts. The quilting is great too! Speaking of BOM debuts, Sassafras Lane unveiled their paper-pieced Arcadia Avenue pattern. By my observation, Arcadia Avenue was the most featured pattern in Market booths, appearing in a minimum three separate booths. Books and patterns weren't the only products introduced; fabric lines were unveiled too. Carloyn Friedlander has a new collection called Doe. 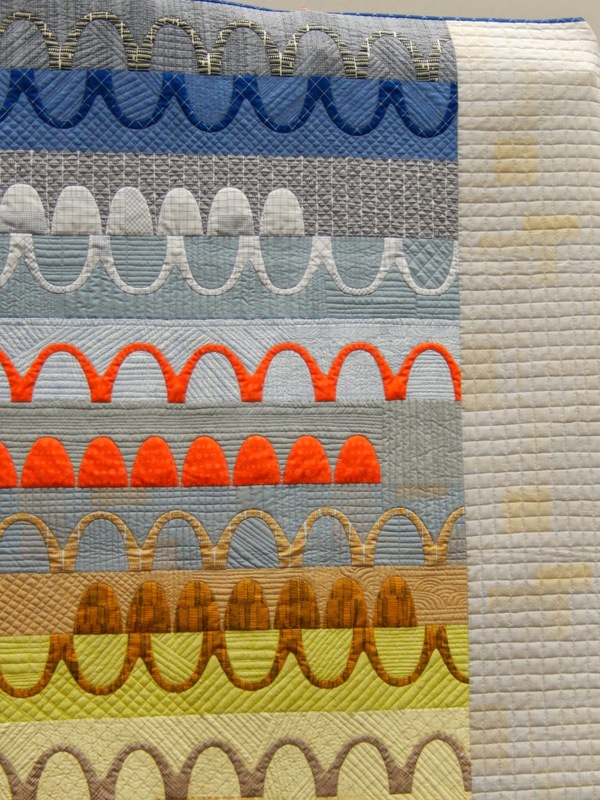 Her fabric prints and quilt projects are reflective of her architectural background. Denyse Schmidt showed off her new line of fabric, Franklin. Heather Bailey also had some new patterns and fabrics to show and tell. 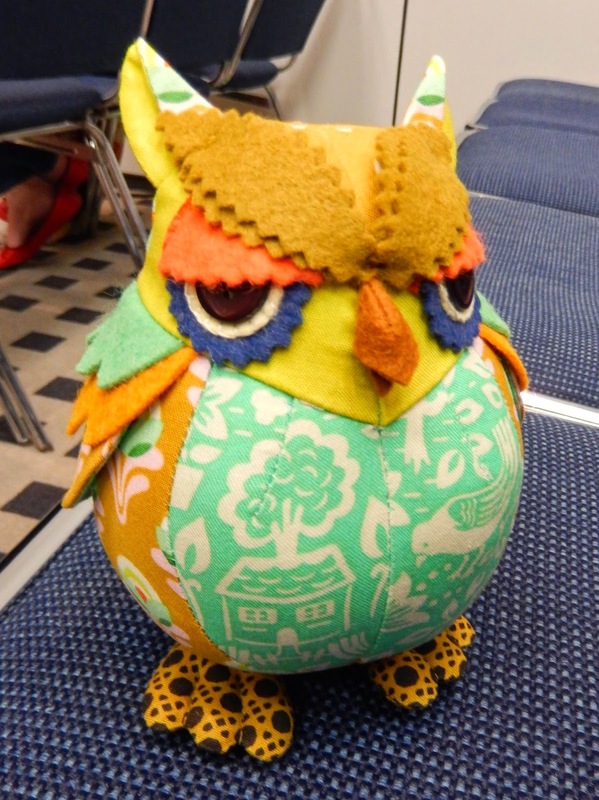 My favorite was this cutie owl pincushion, but I doubt I could stick a pin in him. I kept scrolling though all the lovelies. Lucky you to see it all in person. I doubt I could stick a pin in the owl too. He doesn't look like he would be happy about it, but I love his scowling, grumpy face!